On June 1, 2013, Richard Clark, 47, was killed on I-95 in Johnston County, N.C., after a tractor trailer overturned on the highway early that morning. The N.C. Highway Patrol determined that the overturn occurred after the truck driver fell asleep at the wheel. Sadly, this is neither the first, nor the last fatality involving tractor trailer accidents to have happened recently in North Carolina. There are a number of reasons why tractor trailer accidents occur – from driver fatigue or reckless driving to improper truck maintenance. No matter how it happens, a thorough investigation by the truck accident lawyers at Ward Black Law will reveal if and how a truck driver or company should be held liable for a tractor trailer accident. 1. 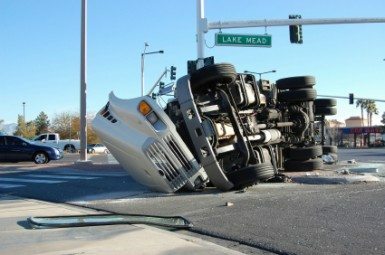 Truck Accident Claims Are Complex. Personal injury claims resulting from tractor trailer accidents are typically more complex and difficult to litigate than car accidents involving passenger vehicles. Both state and federal laws apply to interstate tractor trailers that cause accidents here in North Carolina. In some cases, you may be going up against the trucking company or truck manufacturer and their seasoned corporate legal team. The trucking company or truck manufacturer may be at fault for what happened in a tractor trailer accident rather than (or alongside of) the truck driver. Whether the accident was caused by faulty engineering or improper operational guidelines, the experienced truck accident lawyers at Ward Black Law will know how to help and against whom to bring your claim. 3. Trucking Companies Often Have the Advantage. With almost unlimited resources and attorneys kept on retainer, trucking companies and truck manufacturers often have the advantage when litigating a complex tractor trailer accident lawsuit. However, an experienced truck accident lawyer will know how to best combat these companies – resulting in the best possible outcome for you. 4. The Right Attorney Will Provide Peace of Mind. Although monetary compensation cannot change what happened, it can help lessen the stress surrounding medical bills, employment, rehabilitation, and your future. The attorneys at Ward Black Law will encourage you to focus on your recovery while handling the entire claims and litigation process for you. Hiring an experienced, honest legal team will provide you with some much-needed peace of mind as they work tirelessly by your side and offer you the consideration and compassion you deserve. If you or someone you know has been injured or killed as the result of a tractor trailer accident, we encourage you to contact the truck accident lawyers at Ward Black Law. We will answer your questions and even provide a free case review. You can reach us by phone: 1-877-256-1214 or by email: info@wardblacklaw.com.